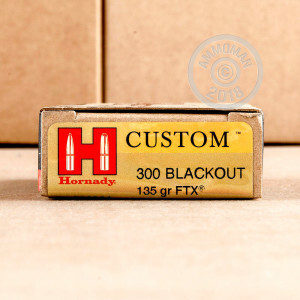 This 300 AAC Blackout cartridge by Hornady is a superb solution for coyote control, bagging bucks, and keeping your castle clear of malevolent intruders. The round owes its great versatility to its 135 grain FTX projectile. The bullet is exceedingly accurate thanks to its streamlined secant ogive profile, and its pointed polymer tip lets it maintain a very flat trajectory in flight. That tip compresses downward during impact in order to initiate debilitating expansion. The FTX further features an InterLock ring which unites its heavy jacket and high antimony lead core, so the two are virtually inseparable to promote superior weight retention during penetration. No medium game on earth would be thrilled to find an FTX whizzing toward it. 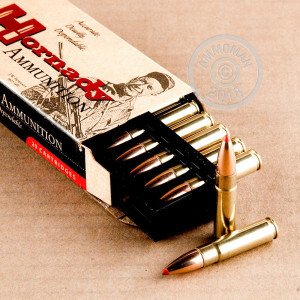 Hornady’s Custom line of ammunition is crafted to give you the feel of a meticulously crafted handload direct from their factory. This round has been hand inspected inside and out to ensure that its quality in no way deviates from top notch, and its select brass casing, clean burning propellant, and sensitive primer are all up to the task no matter how you’d engage them.